The Card Grotto: Ladybug Fun! Thank you for joining me for Elzybells sneak peeks day 3! Only one more sleep then we can get our little mits on them!! Are you excited? I know I am!! So for my todays peek I am showing you this gorgeous stamp called Ladybug Fun I have stamped the bears out and coloured with Copics, cut out and mounted to dark yellow CS then added to base with 3d foam pads. The base is simply light yellow CS added to a white card blank with a dark yellow strip added then the sentiment layer - isn't that new sentiment lovely? Prima flowers added to the panel with a white brad. I have seen some great sneak peeks so far and I am sure there will be loads more today! :0) I have another for you later too! STAMPS: Elzybells Art Stamps. INK: Memento Tuxedo Black. CS: Craftwork Cards, Doodlebug Designs. ACCESSORIES: Prima Flowers, Doodlebug Designs brad, Copic Markers. Awwww, this is sooooo cute!!! Ooh!! Michelle gorgeous card! !i adore these bears!!!! Oh Michelle, this is the most cute card I have seen in ages, I love it!!! Another adorable card!! 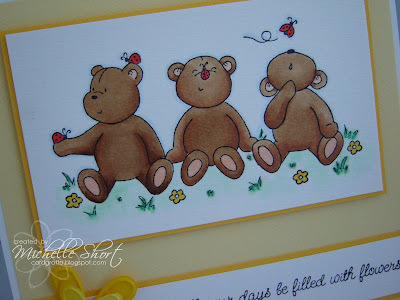 I love these lil' bears and you've coloured them superbly! I love the layout and that sentiment is lovely! Great card! Love the bright yellow flowers, so cheery! Gorgeous card, and another stamp for my ever-growing Elzybells wish list!